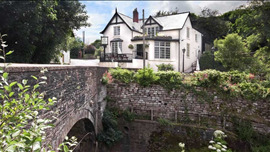 Formerly owned by chef Matt and Lisa Tebbutt who made a great job of transforming this one-time stationmaster's house into a relaxed and informal pub/restaurant of the best sort, it now has new owners Alan and Sue Long at the helm, who re-opened the premises in March 2015 as the Foxhunter Inn. The Grade II listed stone house on the edge of the Brecon Beacons looks quite unremarkable at first glance, but the interior oozes character with its flagstone floors and wood-burning stoves. The kitchen is in the capable hands of the chef who worked alongside Matt for twelve years and the feedback from diners has been very complimentary. Expect starters in the shape of deep fried whitebait with paprika, chefs own tartare sauce and lemon or pork, liver and herb pate served with onion marmalade and toast. When it comes to main courses there's seafood bake with cod, prawns and asparagus baked in cheese sauce paired with baby potatoes or meat fans might opt for the 9oz sirloin with roasted mushrooms, onion ring, chips and mustard sauce. Desserts are in keeping with an apple, pear, date and polenta crumble and clotted cream or a rich chocolate and vanilla pudding with butterscotch sauce. If you want beer, there are bottles aplenty, but it's worth asking to see the classy wine list.